We’re running a series of early morning Pilates sessions. Starting at 8.00am each Wednesday the classes quickly filled up. Pilates is an exercise system that focuses on stretching and strengthening the whole body to improve balance, muscle-strength, flexibility and posture. It is suitable for people of all ages and abilities. We’ll post details of our next series of classes here on our website. 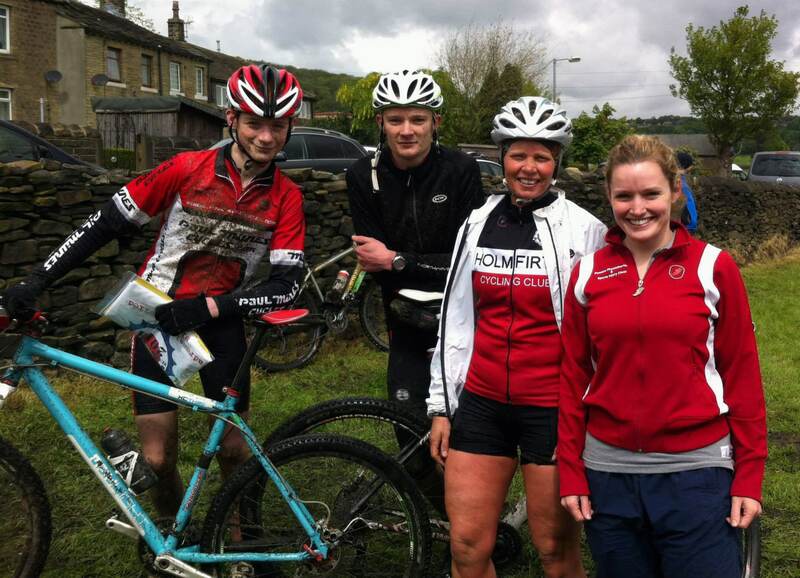 We’ve sponsored and taken part in the Colne Valley Mountain Bike Challenge that raises funds for Golcar Scouts for several years now. This year we provided sports massage to tired legs at the finish to raise funds for Holmfirth Macmillan Cancer Support Group. We raised a total of £110, which Karen presented to Gerry Beaumond, Chairperson of the Group, at our clinic on Lewisham Road, Slaithwaite. Pictured below is physiotherapist Aideen with the fastest finishers.